Today, I’m writing this article as a warning. Maybe you’re a loyal reader of Doctors Health Press, or maybe you’ve just stumbled upon this page; either way, if you’re interested in foraging for wild mushrooms or are already doing so, I feel it’s my duty to urge you to stay far and clear of wild mushrooms. Why? Because they could ultimately kill you. I understand it’s easy to see the word “natural” and assume it’s synonymous with “healthy.” After all, food production and farming methods have become such a gong show that it’s easy to believe anything that’s not mass-produced is a safer option. Foraging for food (i.e. gathering vegetation) has become increasingly popular as people look for modern farming alternatives, so they can live off the land. But doing so can kill you—so it’s wise to avoid foraging or buying foods from people who’ve foraged for them, especially if you haven’t been trained to spot potentially poisonous plants. 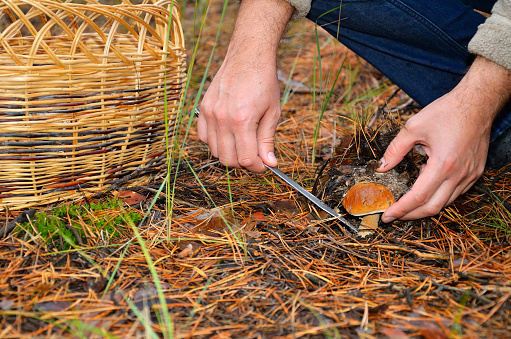 Although I’m not surprised to learn that foraging is becoming an increasingly popular method of attaining food, I’ll admit I was a little shocked to hear about the popularity of foraging for mushrooms. Wild mushrooms are extremely dangerous; not even trained fungi specialists (mycologists) can always tell the difference between safe and deadly strains at first sight. A popular form of wild mushroom, for example, is the Aminata bisporigera. There are more than 600 types of Aminata mushrooms, and they are the cause of most deaths related to mushroom toxicity. That’s right, I said deaths. Accidentally eating one of these mushrooms can kill you. And they do it in a sneaky fashion. These mushrooms, found in parks and forests across eastern North America, look like mushrooms you’d find in your soup or at the dinner table. Known as “Destroying Angels,” these poisonous fungi will waste no time wreaking havoc on your body in three stages. The first stage includes common symptoms associated with food poisoning. You’ll likely experience pain, nausea, vomiting, or diarrhea for a six- to 24-hour period. The next stage is scary because you’ll feel fine—but you might not be at all. Your health situation will appear to improve, but don’t be fooled by this false recovery—it’s the calm before the real storm. The third and final stage occurs roughly 48 hours after you begin feeling better. During this stage, you can begin to experience liver failure. The poisonous effects can even spread to other organs and eventually kill you. The only way to prevent this from happening is to avoid eating any and all foraged mushrooms. Just because something comes out of the earth doesn’t mean it’s good for you—so exercise extreme caution when buying food from vendors selling “natural” products or items they foraged themselves. Before buying, ask lots of questions and if they don’t seem to have the answers—don’t trust their products. Some things are better purchased from a grocery store, and mushrooms are one of them. Unless you’re getting them from a recognized farmer, tread lightly. You don’t want to end up eating the wrong thing. As the saying goes, better safe than sorry, right? Trust me on this one. Canadian Medical Association Journal, “Eating wild, foraged mushrooms can result in liver failure or death as misidentification is common,” Science Daily web site, July 13, 2015; http://www.sciencedaily.com/releases/2015/07/150713131340.htm.